72% COCOA - Simple, silky, subtle. 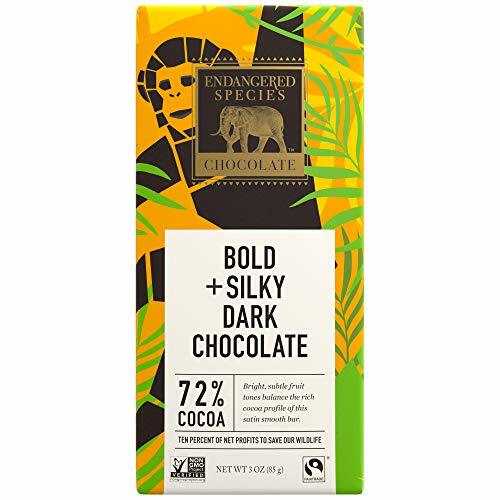 Experience the rich cocoa profile of our premium 72% cocoa dark chocolate for a taste dark enough to push your taste buds, with a subtle linger you won't soon forget. HIGH QUALITY INGREDIENTS - Bittersweet Chocolate (Chocolate Liquor, Cane Sugar, Soy Lecithin, Vanilla). We believe that to craft premium world-class chocolate, there's no way around it: you need the best ingredients. Our clean, natural ingredients are selected for their quality and sustainability, with a dedicated team constantly focused on finding the ideal ingredients for maximum taste. NON-GMO, FAIRTRADE CHOCOLATE - We care about the farmers who grow the cocoa that we use in our products, and we're dedicated to supporting communities that practice sustainable farming practices. We commit to paying premiums so that you can be sure that our chocolate, made in America, uses fair trade cocoa that can be traced back to Fairtrade farms in West Africa. 10% GIVEBACK - 10% of our net profits are donated annually to current 10% GiveBack Partners; each is guaranteed a minimum annual donation of $10,000 and is free to use the funds on projects they deem most important. With over $1.4 million generated in the past three years alone, each chocolate purchase adds up to big support that helps wildlife thrive. VEGAN AND GLUTEN FREE - Contains soy. Produced on equipment that also processes product containing milk, peanuts and tree nuts. Made in America. Final Price as low as $24.88 Shipped!